The species name is Datura candida, from the Solanaceae family (same as the potato). 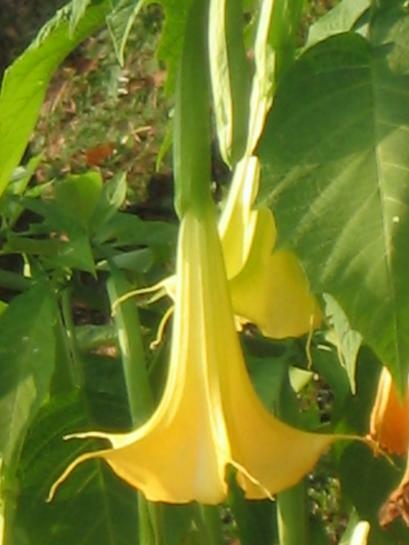 The plant contains the drug scopolamine, which is used in medicine to control motion-sickness. A low-growing wild variant is called “sacred datura” or “loco weed,” which is still used by some southwest Native Americans as a hallucinogen in religious rituals. Cattle ranchers are careful to keep their livestock away from poisonous loco weed. 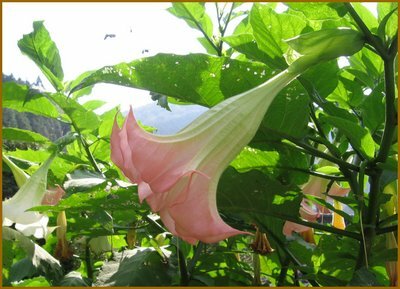 Many people know the trumpet flower from a famous painting by Georgia O’Keeffe. In Japan, there are various names for this flower, which originates in South Asia. It was introduced to Japan as a medicinal plant during the Edo period. It might grow as much as 2 meters in hight and flowers from Summer to late autumn. From the leaves a medicine for asthma and coughing is produced. More flowers in my neighborhood. Click on the photo to see the enlargement. February is on its way out with Bangalore getting as hot as an oven! But the gift from nature to endure the heat is the golden yellow abundance of the Tabebuia chrysantha that is flowering all over the City, gladdening the tired eye. 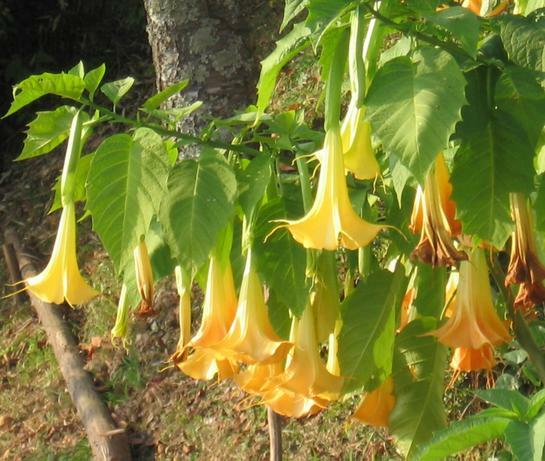 Also known as the Trumpet Tree, this Brazilian beauty has several species which range from northern Mexico to northern Argentina and central Venezuela. In Bangalore it starts amazing everyone with its turmeric yellow dazzle in the oddest places. Venkatappa Art Gallery has a grove of this gorgeous, ornamental tree which is useful for bees with its honey plants and humming birds love it as well. It will blossom only during February and March. 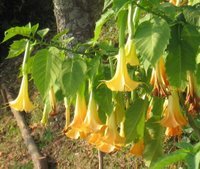 The Angel's Trumpet grows in many of the large gardens in the well-off suburbs of Nairobi, where it flowers in July, making it a kigo for the cold dry season.
. LOOK at more photos from Caleb Wothes Mutua! A soft-wood, fast-growing shrub from 4-12 feet (1.3 - 4 metres) in height, it bears large, pendant, trumpet-shaped flowers. The white variety is very sweetly scented in the evening. This is a common, but very poisonous garden plant. It is available in a variety of different colours, including white, yellow and pink, and in single and double forms.
. . . CLICK here for Photos : Datura suaveolens ! Such a nice reminder that winter will not be forever! Our gardens are synchronized on opposite sides of the Pacific Ocean! Yes, I know the exercise and do it sometimes. In my mind I call it "The Heavenly Trumpets" because of the sounds that unfold in the ears when covered properly to cut out any "real" sound from outside. ANGEL’S TRUMPET FLOWER: The species name is Datura candida, from the Solanaceae family (same as the potato). 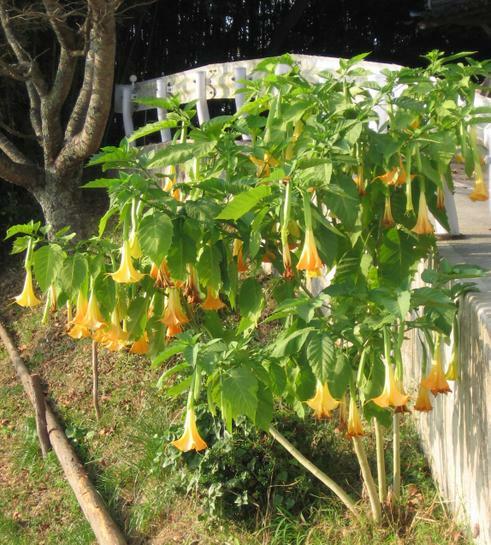 The plant contains the drug scopolamine, which is used in medicine to control motion-sickness. A low-growing wild variant is called “sacred datura” or “loco weed,” which is still used by some southwest Native Americans as a hallucinogen in religious rituals. Cattle ranchers are careful to keep their livestock away from poisonous loco weed. Many people know the trumpet flower from a famous painting by Georgia O’Keeffe. When you find the Japanese name, please send it to me, ok?